When exotic hotel rooms with a view aren't enough for your wanderlust soul, try something little closer to home with these pristine villas on AirBnB across Malaysia for the ideal family vacation or couple's retreat. Touted as the perfect spot for honeymooners, this secluded bungalow sits on the leafy foothills of Bukit Sawak Forest Reserve; a family-run property where privacy and luxury meet unbeatable views of the surrounding hills and paddy fields. More info here. Who can resist this gorgeous rainforest retreat in Janda Baik? The villa can accommodate up to 16 guests with its 4 spacious bedrooms, each of which overlooks the green rainforest. The perfect place for daydreamers and stargazers, it’s no surprise that this peaceful spot has consistently bagged a 5-star rating from guests so far. Click here for more. 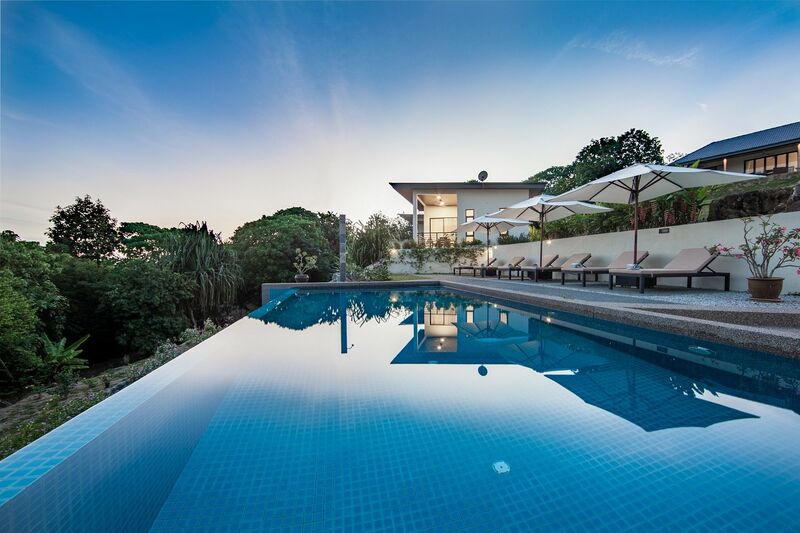 Here’s what you need to know about this dreamy clifftop house overlooking The Straits Of Malacca: At RM4,890 a night (at the time of writing), it boasts 2 King-sized bedrooms, 3 double Queen-sized bedrooms, a 950 square-foot infinity pool and pool bar as well as an 8-person Jacuzzi. Bonus points to the owners for making this property wheelchair-friendly, too! More info here. When in Sabah, don’t miss this chic tropical retreat by Kudat Riviera. A 2 bed-room luxury villa just a short walk from the beach, Sunbeam features a full kitchen setup and private balconies from both bedrooms that overlook a the garden and swimming pool. More details can be found here. Want an uninhibited view of Ferringhi Beach and Penang Hill right from your bedroom? Then bookmark this 2-storey villa, equipped with 5 bedrooms, 2 spacious balconies for enjoying the surroundings and dreamy living spaces that are straight out of a Nancy Meyers film. Start planning your Penang staycation here. Now you can enjoy the natural beauty of Kampung Hulu Rening in Selangor from the comfort of a luxurious 9-bedroom villa, complete with sunken gardens in a spacious courtyard and a balcony overlooking a nearby river. Click here for more information. Not far from Cenang Beach sits this exquisite teak wood house that’s decked out in traditional Javanese décor. Limasan Padi can accomodate up to 8 guests (infants stay free-of-charge) and like its name suggests, the property is surrounded by padi fields as well as 4 swimming pools and 6 other villas. Click here for more information. While this luxury lodge gives us all the right kind of glamping vibes, it really is the perfect place to wind down and connect with nature. If you’re staying there with kids, you can request a tent for 4, complete with bedding or stick with any of the 9 beautiful bedrooms available here. Find out more over here.